Buying gifts for some loved ones can be a real nightmare. You know who I'm talking about, that family member who is never in one spot. You can’t just get away with giving them with a sweet new Nutribullet or a new pack of 6 wine glasses. You need to think outside the box! Lucky for you just in time for Christmas we have come up with this list of gifts for travellers.. that they actually want (and will appreciate). So What Are The Best Gifts for Travellers? Every traveller needs a decent durable power bank. The EasyAcc is smartly designed to be water, dirt and snow proof to tackle every location under the sun. They have even included a compass, carabiner and a Led flashlight for ultimate convenience. Wet wipes are another best friend for the traveller. However using 10 regular sized wipes is just inconvenient. Step in Epicwipes, these Biodegradable bad boys are a whopping 80 x 50 cm making showers on the go an absolute breeze! Taking time out is an essential. Even for the travellers in your life. If they don’t have a small compact hammock, do them a life-changing favour and get them one! There is nothing better than exploring all day and finding the perfect spot to relax and remembering you have a hammock packed away! Bag space is very precious, you can’t go filling up your bag with unimportant things like Monday - Sunday underwear. Every traveller needs at least two or three pairs of quick dry underwear! The lounge or airport clubs are a dream for most travellers. Give the traveller in your life a special (and much appreciated) gift of lounge access for their next trip! There is nothing you appreciate more before (or after) a long flight than taking a shower and eating some decent food. Travellers have a tonne of downtime, perfect for reading. Unfortunately, it’s just not possible to travel with a library of your favourite hardcover books. Luckily the Kindle can! It even slides easily into the smallest of bags. Perfect for travel guides, maps and that copy of 50 Shades of Grey. Airbnb is the most common place where people find their accommodation these days. Its hands down the best place to find amazing, cheap accommodation worldwide. You never know where the traveller in your life will end up so a voucher is perfect! Never used Airbnb before? Click our link to receive a discount on your first booking here. After we learnt how to become house sitters, we managed to save ourselves $1000s in rental costs. With all those savings are able to stay in beautiful homes with both Airbnb & housesitting! The Actionclub backpack is perfect for the adventurous traveller. It includes a rain cover and a lock to keep all the essentials safe. For more great ideas check out the Wanderway Shop. Give your loved one the gift of free accommodation. When your house sitting you don't need to pay for a hostel/ hotel or Airbnb! Having access to a house sitting platform means they can pick and choose the location and length. See the best house sitting sites so you can pick the right one! 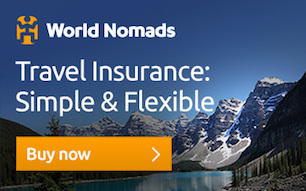 Travel insurance is one of those things you don’t really think about until it is too late. Be proactive and get the traveller in your life travel insurance. This is a guaranteed winner and they will absolutely love you for it! Travellers love to document and share their experiences. Give the gift of instant Polaroids from any smartphone! They can impress their newly made travel friends or send them back home. I mean who doesn't like receiving a letter in the post with an update of where your loved ones are? Pretty essential when your working from the Smith Residence!